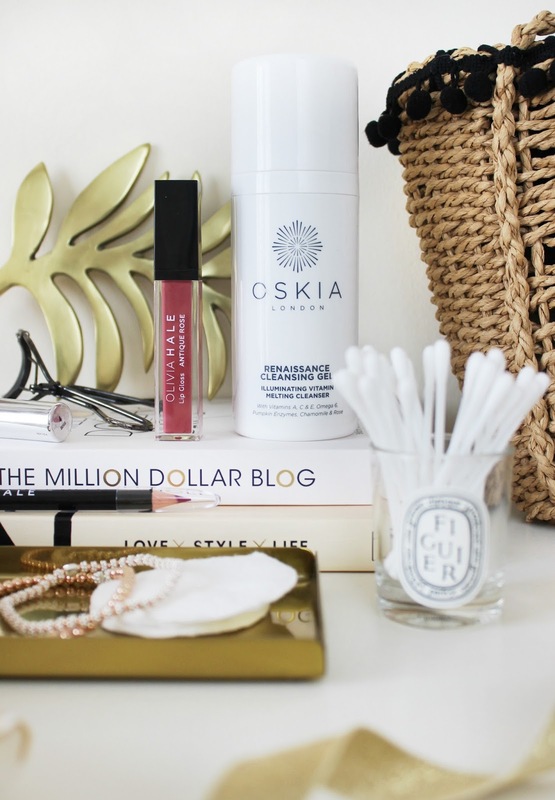 The Oskia Renaissance Cleansing Gel has been a long term favourite of mine, as with most beauty bloggers. I use it religiously, but recently I’ve been experimenting with a new skincare tool (more details next month), and this cleanser works beautifully with it. It’s incredibly nourishing and soothing on my dry skin, and it leaves my face feeling fresh without being stripped of natural oils. It is more pricey than the average cleanser, but with skincare, I think it’s definitely worth it. As I mentioned before, I’ve kept things super simple on the makeup front. Mascara has been my go-to product, on top of curled lashes. It looks fresh and natural, very light and easy to wear for summer. My trusty Shiseido Eyelash Curlers give the perfect curl without breaking or pulling any lashes which is exactly what I need from a lash curler – so these have taken permanent residence in my makeup bag this month. With curled lashes, I’ve been loving a beautiful summer glow and a very fresh and dewy base for my makeup. The L’oreal True Match Foundation is known for being a great light foundation with decent coverage and a glowy finish so I picked it up at the end of May to give it a whirl. I can honestly say it’s one of the best drugstore foundations that I’ve ever used – incredibly lightweight, easy to blend, long wearing and dewy. The coverage is buildable, and with the L’oreal True Match Concealer I get exactly the kind of flawless base I want – one that still looks natural, and a your-skin-but-better finish. I popped into Home Bargains the other week to check out their homeware section, and I stumbled across a whole newly launched makeup range by Olivia Hale. The packaging looked incredibly sleek (everything was packaged in neat black boxes), and each item was priced at 99 pence as an introductory offer. Of course, I was intrigued! I ended up choosing the Olivia Hale Lipgloss and Liner in Antique Rose which seemed to swatch the best, and I’ve been wearing them together a lot this month. The formula isn’t sticky like most glosses, and the colour payoff is beautiful. It’s a gorgeous warm rose pink that wears well and looks beautiful with the minimal makeup that I’ve been loving so much. Two total bargains! I worked with jewellery designer Annie Haak designs this month, and I was kindly sent the Annie Haak Exquisite Bracelet Stack*. 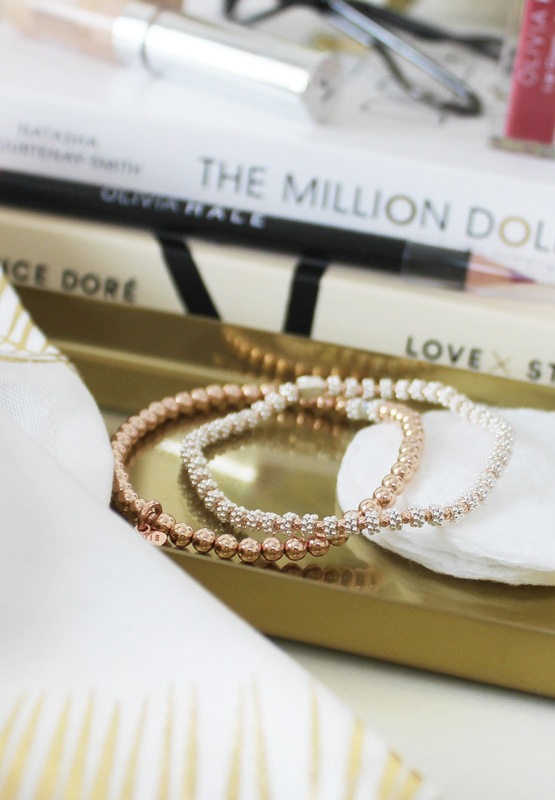 The bracelets are subtle, sparkly and incredibly well made, so I know they won’t just be a favourite this month! Annie Haak has some beautiful jewellery designs which can be layered and stacked together for a more statement look too – and I’m totally in love with the pieces I’ve seen. My new Zara Pom Pom Basket Bag is something I bought for my holiday next month but I love it so much that I’ve started using it already! It’s the most adorable straw raffia bag with a pom pom trim and long handles so you can wear it on your shoulder. I know I’ll be using it a lot next month too, as well as this stunning Red Mini Tote Bag that I also purchased from Zara for the summer. In fact, I’ve overhauled my wardrobe with a lot of new pieces from Zara which I’m totally smitten with! Fresh flowers have been a serious favourite this month. I’ve been loving warm summer afternoons in the garden with BBQs or iced coffee. The peonies have been in full bloom and they look absolutely gorgeous! Previous Post Six Summer Discoveries.